I realize we live in a world of instant gratification, feelings of entitlement, fast fixes, and throwing out of consumables rather than making the necessary adjustments/repairs to make things work. I get it – it’s simply a sign of the times; a worldwide mentality. At least in the so-called civilized countries – but especially perhaps in our industry. I am particularly referring to owners, riders, trainers who have just spent a lot of money on a horse and a lot of money on a saddle (perhaps the last in a long line of many different attempts to find one that works, but, in the process, has perhaps caused significant damage that will take some time to repair). I once had a client who had problems some of you may have experienced. Her horse had an old injury at the withers which, with pressure from any saddle created immense pain for him, which eventually resulted in him bucking off the rider. With therapy, he is apparently now pain free, but has a learned behaviour to not tolerate anything on his back. He is still bucking and crow hopping on the lunge line. 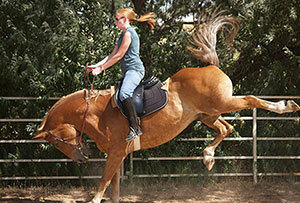 There are strategies for desensitizing and re-learning to tolerate and understand that the saddle is not going to hurt. Conceivably this has been bothering him since he was started under saddle, in other words, a very old injury. Everything is an association to saddle pain, cross ties etc., and everything is an anticipation of pain to come. 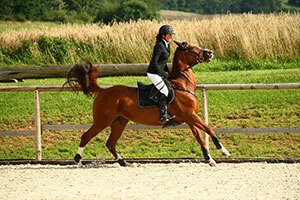 Obviously, a full veterinary evaluation needs to confirm that the horse is completely sound – that the suspensories, etc. and the feet are ok. Stomach ulcers also need to be considered, especially in a horse that was dealing with so much pain for so long. Even if the back seems better, there’s still an unresolved issue present. The learned behavior of bucking is unfortunately sometimes never fully resolved. You have to get them trusting from the ground again before you get someone on the back. I am sympathetic to how difficult trainers in this industry have it – not the top two per cent who make their money competing as well as elite riders, but the 98 per cent who may struggle to make a living. For them it is a bonus to work with a saddle company that is willing to reward them for student referrals and sales – and it is difficult sometimes for them to make objective recommendations. This industry is known for its lack of regulation and benefits and regular salaries, and is extremely vulnerable to the vagaries of the economy. It’s hard sometimes to separate ethics from the need to survive, but at the end of the day we can all only do what we feel is what we need to do. You may have the dilemma of a student or a potential customer trying out a horse or deciding whether or not to keep a horse that may be ‘too much’ to – when these are being ridden saddles that may not fit either of them properly. It’s a chicken and the egg type of thing…do they invest in a saddle if they aren’t sure about the horse’s future, and how can they measure the horse’s true potential without a fitted saddle? I also want to point out the number of trade shows and horse shows who are now supporting a closed system of exclusivity by some saddle companies who pay the big bucks to be “official saddle of…” I feel they are doing the competitors and attendees a huge disservice by limiting the marketplace to a select few who can afford the umpteen thousands of a ‘sponsorship’ to be named such and make these demands. Spectators may not realize that they are paying to support these artificially induced limitations in the marketplace. Of course, those who see their saddle company at the show may not care or necessarily realize what’s going on, but for the rest of the attendees, I think it’s an issue. That may be why the popularity of these equestrian trade shows seems to have declined in past years – who remembers Equitana USA? In Europe, it’s still touted as the largest equestrian retail show in the world – encompassing the space of 17 airplane hangar sized buildings over two weeks of activities! I kind of went all over the place here, but I had to share some of what is going through my mind right now – and that is the purpose of a blog, is it not? Feel free to comment and send me your thoughts on any of the above points.